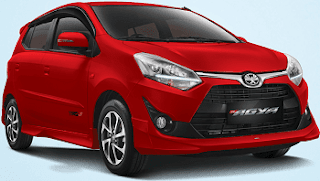 Specifications And Price Of New Toyota Agya . Toyota Agya launched 2013 and directly accepted by Indonesian consumers. Although included in the ranks of low cost car type green car (LCGC), yet Toyota design and market it with various features and latest technology. But it seems the market also see many shortcomings when the car was launched as LCGC. The sales never look impressive for the size of a Toyota brand, and its competitors, especially the Honda Brio Satya, are undermining the market. This was later repaired by Toyota, along with Daihatsu. The year 2017 marks the presence of Agya and Daihatsu Ayla which experienced significant revisions, especially in the technical section. Agya which was only engined less than 1,000 cc is now equipped with a choice of new engines with a capacity of 1.2 liters equipped with Dual VVT-i technology. Old machines were still maintained, but now equipped for the highest variant of US $11268. A price that actually passes the LCGC regulations. Even more expensive than Toyota Calya G bertransmisi matic perched on the number US $11194. Calya is also equipped with Dual VVT-i technology. The price as you can see above, ranging from US $9477 for the lowest variant. But the price surge was of course coupled with significant changes, although in some parts was felt less. Ok, the new machine with a variety of advanced technological advances. But in the cabin is still there that feels less qualified. For example, somehow in the cabin Agya only equipped with monochrome head unit that already has the ability to connect Bluetooth. Compare with its twin that has been equipped with multimedia touch screen system, with a price of approximately US $298-US $373 cheaper. The quality of materials used in the cabin is still fairly decent, because it is in accordance with the price. Door trimnya now given a combination of plastic materials and fabrics that give enough dynamic impression in the cabin. Perhaps this is Toyota's strategy, the parent of Daihatsu, who wants to encourage consumers to prefer Daihatsu. Because they are currently launching Daihatsu to become an extension of Toyota in the class of cheap cars, for emerging markets. But this has to be confirmed again. Overall, both in display and technical, Agya just give freshness to LCGC hatchback market. His face embraces the Keen Look design language that you can find also in the latest Toyota cars. Overall, this car is only experiencing the evolution of design. But that's exactly what is needed by Agya and its twin, Daihatsu Ayla at this time. His face is equipped with a grille that widened below. Headlights are now supplied which is also new, complete with LED technology driving light. On the side not found significant changes in addition to new wheels measuring 14 inches. In the highest variant, the color is also 'contemporary' with a combination of silver-black color with a design that also looks sporty. In addition, for the highest variant (1.2 TRD) is equipped with a sporty body kit. At the stern, again not much change other than the spoiler baggage that has been equipped with brake lights. In addition, the taillights are also not much changed other than the addition of garnish attached to the trunk door. What is interesting is actually the rear bumper on the variant 1.2 TRD. In addition to looks sporty, the model looks make Agya more expensive than before. Toyota finally paired 4-cylinder engine for Agya, without leaving the 3-cylinder version. The interesting three-cylinder engine is equipped with VVT-i technology with a fixed capacity of 1.0 liters. Meanwhile, 4-cylinder engine has a capacity of 1.2 liters. In addition to large capacity, Dual VVT-i is also installed here. The engine is similar to the Toyota Calya has a power up to 88 PS at 6000 rpm round, while smaller engines spout up to 67 PS in the same rotation. Unfortunately, because at the time of this writing made this new car glide, then we have not had time to test it. Therefore, fuel consumption and performance can not be felt. But do not worry, we will soon test one of these LCGC pioneers. Just wait.